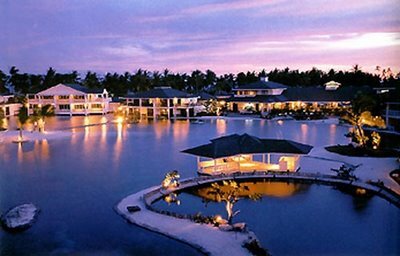 Plantation Bay Resort is sprawled over 11.4 hectares in Marigondon, Mactan where the beach is white sand and the water crystal-clear and blue. It is in Cebu, one of the most dynamic urban areas in the Philippines with the most ethnic diversity. It boasts of cottages of colonial-plantation architecture scattered around a number of artificial lagoons. From the moment you walk in the lobby, the sound of water greets you like a harbinger to another world. The lobby itself is decorated with old wooden floors, large wooden sofas, large printed rugs, high ceilings, and the thrill of open-air music from a grand piano. The lagoons of Plantation Bay Resort are the main focus especially behind the reception area. Looking at the lagoon from the main lobby, one would think that it is only one lagoon crisscrossed by several footpaths. But it is really several lagoons with a slightly raised swimming pool off its center. Every room at Plantation Bay Resort has a view of the water. The overall effect is like being in a Caribbean village. The Water’s Edge is the most sought after room, located right at the edge of the lagoon. From the balcony, one can be in the water within 2 seconds. 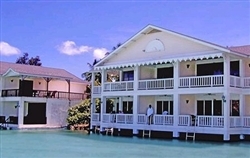 The Lagoon Side has a king and queen beds, with luxurious and separate tub and shower. The ground-floor rooms feature generously sized balconies, which open directly onto the beach. The Lagoon View rooms are situated on the second floor or a few yards further from the beach. For groups and large families who wish to share one room, why not try the Club Room, a combination of queen and bunk beds. Modified dormitory-style bathrooms, it is suitable for six to eight occupants. The two-bedroom suite has two master’s bedrooms, both with extra-large bathrooms, living room and powder room. It is the most popular choice for two couples vacationing together and families with several children. Plantation Bay Resort has two other special suites, each of them unique. The Riverboat Suite is a two-bedroom cottage built on stilts over flowing water, beautifully shaded with spreading acacia trees. The Penthouse Suite is a two-bedroom house on two floors. The salon and dining area are perfect for entertaining. The master’s bedroom overlooks Mogambo Falls and has a private terrace. Plantation Bay Resort opened its expanded spa called Mogambo Springs in mid-September of 2007. It is named Mogambo Springs to suit the exotic sounding names of the cottages. It sits on a 4,500-square-meter lot beside the artificial waterfall and a two-storey cottage called Magombo. In the spa, Plantation Bay Resort makes use of the available materials such as limestone, treated bamboos, “pandan” for the flooring and “nipa” leaves for the roofs, in accordance with its intention of maintaining a Filipino character. In other words, it has the looks of an 18th century Japanese village with an African sounding name and a Filipino character. Mogambo Springs has 21 massage rooms. Among them is a private villa, ideal for couples and families, with its own lounge area and a hot pool. There are four suite rooms which have bath tubs. A pagoda-like structure stands at the end of the spa facility. It contains two Pagoda Rooms, which can accommodate six persons. Near the reception area, the spa”s pools are tucked in little crannies and gardens. With a 27-square meter area and seats with Jacuzzi jests, it can accommodate eight persons. Nearby, just behind the artificial waterfall, the thalassic pool has 12 Jacuzzi jets, bubblers, fiber optic lighting loose river stone flooring and salt water, pumped directly from the sea. It offers an ample array of services, consisting of the usual massages, spa packages and face and body treatments. It also provides salon treatments. It boasts of 35 therapists who are said to be trained in Singapore. Nenette Castillon, who has been with Plantation Bay since it opened, is the spa director. The massages on offer include the Skinful Pleasures; the Dorn method; the pool massage, which is 35 minutes of a water relaxation therapy (Php600); the stress-relieving chair massage (Php800 for 30 minutes); foot therapy (Php1,800 for one hours); full body massage (Php1,600 for one hour); with choices of shiatsu, Swedish and combination; and aromatherapy oil massage (Php 1,800 for one hour) with choices of harmony, revitalizing, relaxing and sensuality. The one-hour Skinful Pleasures (Php1,800) is an original creation that involves stretching, squeezing, straightening and other motions applied to the skin and muscles. On the other hand, the one-hour Dorn method (Php2,500) is a German healing method available exclusively at Mogambo Springs. It is a holistic manual therapy that is gentle on the joints and vertebrae and helps many forms if physical discomforts like stiffness, back and neck pains, pelvic and lower body pains and general stress. The highlight of the Plantation Bay Resort spa packages is the six-hour and 30 minutes Ultimate Mogambo Springs Experience (Php8,800), which premises maximum pampering with a pool massage, a body scrub, a foot therapy, a facial treatment of choice, an aromatherapy oil massage and a hot oil treatment and nail care in a private treatment room. It is not only the spa which Plantation Bay Resort is noted for. It boasts of several of the finest restaurants in Cebu – the Kilimanjaro Kafe, the Palermo (an Italian Restaurant) and the Fiji Restaurant which serves seafood, Japanese, Korean and other Asian food while the Savanah Grill is great for families or those in a rush. It serves burgers, hotdogs, and other fast-food favorites, all with 5-star flair.